New Delhi, 12 May: Ministry related to Civil Pensioners DoP&PW on Friday issued the orders based on the modified formulation of pension revision approved by the Cabinet will entail an additional benefit to the pensioners and an additional expenditure of approximately Rs.5031 crore for 2016-17 over and above the expenditure already incurred in revision of pension as per the second formulation based on fitment factor. It will benefit over 55 lakh pre-2016 civil and defence pensioners and family pensioners. Based on the decisions taken by the Government on the recommendations of the 7th CPC, orders for revision of pension of pre-2016 pensioners/family pensioners in accordance with second Formulation were issued vide this Department's OM No. 38/37/2016-P&PW (A) (ii) dated 04.08.2016. It was provided in this O.M. that the revised pension/family pension w.e.f. 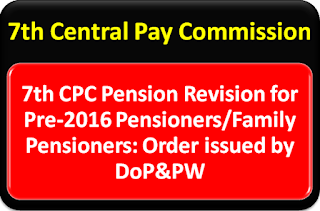 1.1.2016 of pre-2016 pensioners/family pensioners shall be determined by multiplying the pension/family pension as had been fixed at the time of implementation of the recommendations of the 6 th CPC, by 2.57. The aforesaid Committee has submitted its Report and the recommendations made by the Committee have been considered by the Government. Accordingly, it has been decided by the Government that the revised pension/family pension w.e.f. 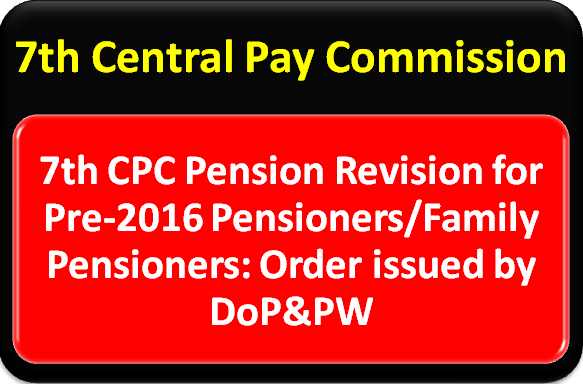 01.01.2016 in respect of all Central civil pensioners/family pensioners, including CAPF's, who retired/died prior to 01.01.2016, may be revised by notionally fixing their pay in the pay matrix recommended by the 7th CPC in the level corresponding to the pay in the pay scale/pay band and grade pay at which they retired/died. This will be done by notional pay fixation under each intervening Pay Commission based on the Formula for revision of pay. While fixing pay on notional basis, the pay fixation formulate approved by the Government and other relevant instructions on the subject in force at the relevant time shall be strictly followed. 50% of the notional pay as on 01.01.2016 shall be the revised pension and 30% of this notional pay shall be the revised family pension w.e.f. 1.1.2016 as per the first Formulation. In the case of family pensioners who were entitled to family pension at enhanced rate, the revised family pension shall be 50% of the notional pay as on 01.01.2016 and shall be payable till the period up to which family pension at enhanced rate is admissible as per rules. The amount of revised pension/family pension so arrived at shall be rounded off to next higher rupee. It has also been decided that higher of the two Formulations i.e. the pension/family pension already revised in accordance with this Department's OM No. 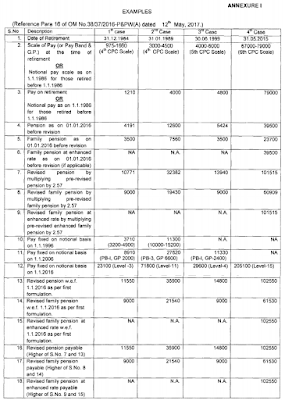 38/37/2016-P&PW(A) (ii) dated 04.08.2016 or the revised pension/family pension as worked out in accordance with para above, shall be granted to pre-2016 central civil pensioners as revised pension/family pension w.e.f. 01.01.2016. In cases where pension/family pension being paid w.e.f. 1.1.2016 in accordance with this Department's OM No. 38/37/2016-P&PW(A) (ii) dated 04.08.2016 happens to be more than pension/family pension as worked out in accordance with para above, the pension/family pension already being paid shall be treated as revised pension/family pension w.e.f. 1.1.2016. The minimum pension with effect from 01.01.2016 will be Rs. 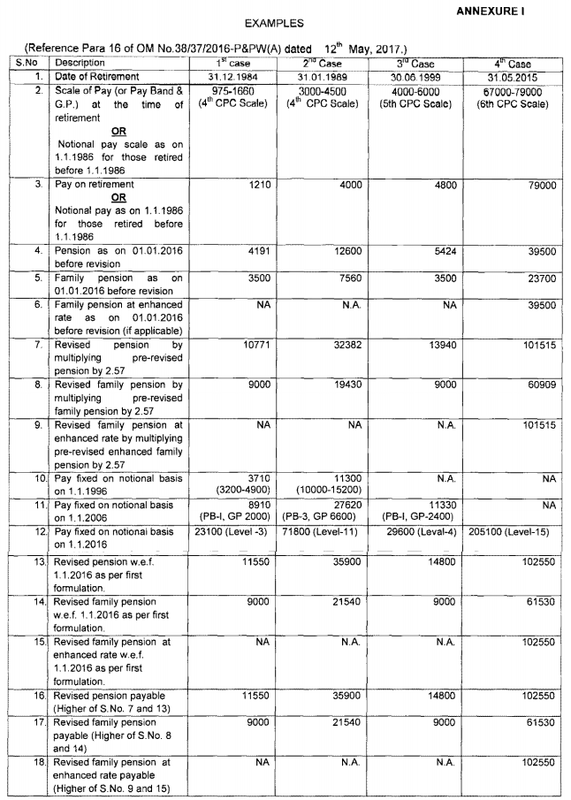 9000/- per month (excluding the element of additional pension to old pensioners). The upper ceiling on pension/family pension will be 50% and 30% respectively of the highest pay in the Government (The highest pay in the Government is Rs. 2,50,000 with effect from 01.01.2016).